attn cleveland: free beer AND a raffle thursday! not a race or a ride, so i thought it would be ok here. if not, i accept the move with an open heart. this week's raffle - a pair of "surprise" track pedals. great quality, sealed bearing, reasonable cost. they look dooope. 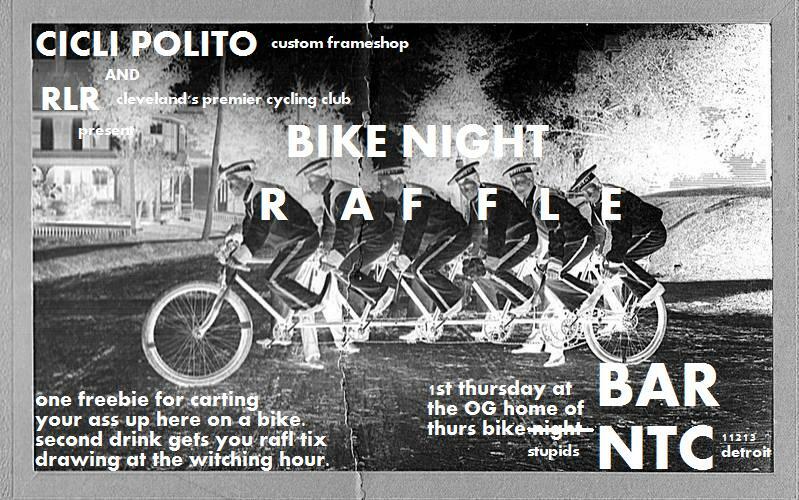 bike night is old, raffle is new. enjoy! Where is it? What is it? When is it? Last edited by rickyaustin; 04-30-16 at 02:28 PM. Bikes: Waterford 1200, Redline Monocog, Redline Conquest Pro, Surly Long Haul Trucker, and a Sunday BMX bike! Horrid flyer aside, it sorta says where it is. Now That's Class, 11213 Detroit Ave., Lakewood. the horrid flyer is actually meant to keep people away, so i'll tell the flyer-maker that it did it's job! happenin' tonight at now that's class (bar ntc is boho-chic) 11213 detroit, cleveland. RLR? Cleveland's "premier" cycling club? RLR? Cleveland's "premier" cycling club? Who are these guys and where were they last night? I've never heard of them before. Are there any real cycling clubs in Clevo besides shop sponsored clubs and posses of polo dogs? where were they last night? I've never heard of them before. there were two of them there last night. and they've been around since 1999, as far as i know?